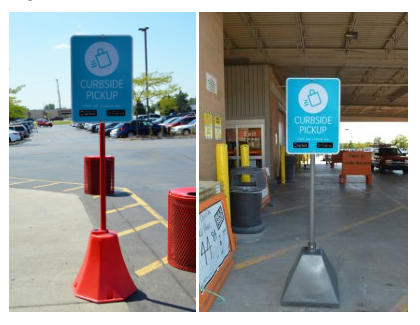 Curbside pickup is making huge waves in the retail and grocery world these days. It’s been wildly popular with restaurants, and even pharmacies, for quite a few years, but it’s really starting to pick up steam in other industries as well. Life get busier all the time, so anytime you can order something online and pick it up without leaving our vehicles is a major time saver. Need a prescription? Call it in, pick it up in the drive-thru or at the pharmacy curbside. Need a week’s worth of groceries, but don’t have time to shop? Order online and have them delivered to you curbside. It’s a new wonder of the world if you ask me. Ideal Shield has the perfect portable sign bases to perform this important duty with ease. Our product ships at only 30 pounds making it simple for anyone to install, unlike a lot of other sign bases on the market which weigh anywhere from 70 to 300 pounds (like concrete sign bases) and require a licensed contractor to install. Our durable, lightweight sign bases are wind tested so they won’t blow away or fall over on the job. Ideal Shield has the optimum solution for all curbside pickup needs. We make it simple for everyday employees to install and move. For more information in the different types of sign bases we have available, contact us today at 866-825-8659.